Financial problems, sickness, aging parents, a chronically unhappy spouse . . . trials will inevitably come along to threaten your marriage. No matter how long you've been married or how strong your relationship is, sooner or later you are going to have a mess to clean up. 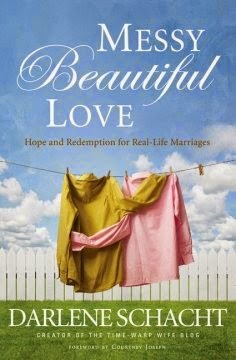 Messy Beautiful Love is about cleaning up messes God's way, exchanging our ideas for his, and being prepared for both the best and the worst that marriage has to offer. Perhaps you've picked up this book because your marriage is messy already-now is the time to make a change. If your marriage is tidy, thank God-there is no better time to prepare for the future. Married life is never straightforward or simple for long. But the reality is this: when you surrender your relationship to God; when you lay your marriage at his feet; when you finally cede control; then and only then will you experience the blessing of marriage as he intended-this is the blessing of obedience. Messy Beautiful Love is an invitation to that obedience. An invitation to surrender. The cynical world says marriages don't last. God knows better. Tune out the world and tune in to him. When you do that, a beautiful marriage is not only possible-it's inevitable. That's something to be excited about. I have followed Darlene's blog, Time Warp Wife, for years and absolutely love her writing style! So signing on to review this book was a no-brainer! Darlene opens the book with the amazing testimony about how God saved her marriage. A raw, gut-wrenching story that reminds you how none of us are immune from our hearts straying from husband and home. She paints this wonderful, beautiful picture of grace that compares marriage with our Christian walk. The same grace that loves and forgives in marriage is that same grace we have received from Christ - that loves and forgives us every single day. A truly Christian marriage will mirror the relationship between Christ and his church. From there she touches on the hard stuff: patience, surrendering our rights, submission, leadership, conflict, communication... Basically everything this stubborn, thick-headed girl needs to hear! This book is written in an easy to read manner in down to earth language, goodness how I love that! Darlene shares wonderful stories from her own life that invite you into her home and make you feel like your chatting with her over coffee. This is a book I would recommend to every wife. It is a book for all women, no matter how long they've been married.